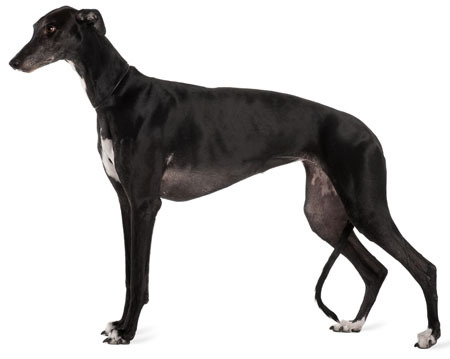 Learn about the temperament and personality of the Greyhound. Discover what he's like to live with, his traits and characteristics and how he generally behaves. And look at lots of Greyhound photos. The Greyhound, the fastest couch potato in the world, is a sweet, gentle, affectionate, adaptable, docile, loyal, intelligent, and loving creature. Yes, they are athletic, and yes, they are fast, but they don't necessarily want to use it. They are prone to short bursts of energy followed by long naps. In fact, they often like to sleep most of the day away. They are mellow and laidback and make excellent house pets. They have a moderate need for exercise, and a couple of short walks per day should meet their needs, unless it is raining, in which case they will be happy to take the day off. They must be kept on a leash or in a fenced-in area at all times, because if a Greyhound gets away from you, you might never see him again. He can spot a squirrel a half mile away and take off, quickly reaching a speed of 40 mph. They are the second fastest land creature on earth, and not reliable on the recall. For this reason, people should not walk a Greyhound on a retractable leash. By the time a Greyhound reaches his top speed at 25 feet away from you, he can easily yank the handle out of your hand and run across town, all the while afraid of the thing bouncing along behind him. Also, never, ever tie a Greyhound to a pole. He might try to take off and break his own neck. A Greyhound parent must pay close attention to the conditions outside, because Greyhounds are temperature sensitive and can easily get too cold or too hot. While they are eager to please the ones they love, they still have the independent spirit of a hound, and need patient and consistent obedience training. They are usually quick to housetrain. They are sociable with people and with other dogs, and many Greyhounds do well with cats. To be safe, do not let your Greyhound and cat outside to "play" together, as the Greyhound's chase instinct may kick in. Greyhounds are tolerant of children and do very well with them. The Greyhounds are sensitive and children need to be polite, or the Greyhound will try to get away from them. A Greyhound will want to be with you as much as possible, and won't want to be left alone for long periods of time. They absolutely thrive on being the center of your attention. Greyhounds, particularly rescued Greyhounds, attach to their owners in a unique and powerful way. They do not however, make very good watchdogs, as they are very quiet and rarely bark, unless they are playing, or chatting it up with other Greyhounds. The Greyhound is moderately easy to train. He learns new commands at the average rate. He is neither difficult nor easy to train. The Greyhound sheds a fair amount of hair. You'll find hair stuck to your couch, carpets, clothes and everything else in your home.